SEE SHORT BLURB FOR ALTERNATE COPY... A complex, intriguing, and important verbal entity, the proverb has been the subject of a vast number of opinions, studies, and analyses. To accommodate the assorted possible audiences, this volume outlines seven views of the proverb -- personal, formal, religious, literary, practical, cultural, and cognitive. Because the author's goal is to provide a scientific understanding of proverb comprehension and production, he draws largely on scholarship stemming from the formal, cultural, and cognitive views. 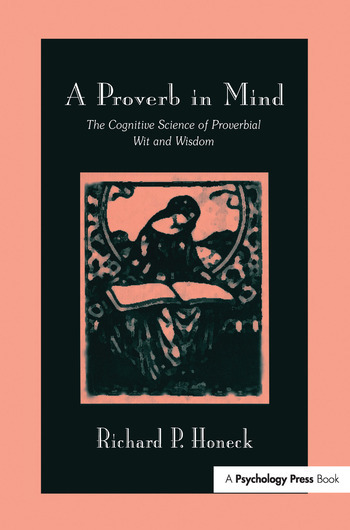 The only book about proverbs that is written from the standpoint of cognitive science, cognitive psychology, and experimentalism, this text provides a larger, more interdisciplinary perspective on the proverb. It also gives a theoretically more integrated approach to proverb cognition. The conceptual base theory of proverb comprehension is extended via the "cognitive ideals hypothesis" so that the theory now addresses issues regarding the creation, production, and pragmatics of proverbs. This hypothesis also has strong implications for a taxonomy of proverbs, proverb comprehension, universal vs. culture-specific aspects of proverbs, and some structural aspects of proverbs. In general, the book extends the challenge of proverb cognition by using much of what cognitive science has to offer. In so doing, the proverb is compared to other forms of figurative language, which is then discussed within the larger rubric of intelligence and the inclination for using indirect modes of communication. Child developmental and brain substrates are also discussed. Contents: Preface. Views of the Proverb. The Tangle of Figurative Language. Cognitive Foundations. Theories of Proverb Cognition. Under, Inside and Outside the Proverb. Brain, Development and Intelligence. New Horizons. References. Appendix: Proverb Source Materials. "Honeck has reviewed what we know about proverbs and, just as importantly, as he did almost 20 years ago, he has given us a roadmap for further explorations in figurative language." "This book is very much needed. It is well argued and researched and will introduce scholars and students of the proverb to the fascinating discoveries which cognitive scientists have achieved regarding proverbs. Professor Honeck makes the complex theories of language and cognition accessible to readers from many fields and various backgrounds in a readable, understandable, and enjoyable style. The book is a joy to read, finding a perfect balance between scholarly and readable language."